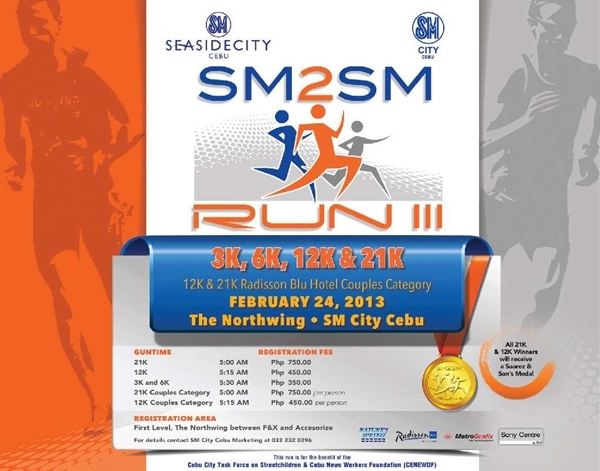 SM City Cebu and the soon to open SM Seaside will come up with one of the most awaited sporting events in the province, the 3rd SM 2 SM run in February 24, 2013. The marathon is projected to attract more than 4, ooo professional and amatuer runners from all across Cebu and the rest of the Philippines. The SM 2 Sm run will start at the North Wing of SM City Cebu at 5 am and runners will take the SRP or South Road Properties route to reach the Chapel of San Pedro Calungsod and the SM Seaside complex. This Cebu marathon will feature 4 events: the 3K, 6K, 12K and 21 Kilometer runs. 1 thousand worth of SM gift certificate for the remaining top 10 finalists. The top 3 12 k runners will receive 10,000, 7,000 and 5,000 Pesos respectively. For more Cebu News and Events, please join us on Facebook at We LOVE Cebu!! !